The two chairs in the sitting room need repaired / replaced. Other than that everything was satisfactory. Thank You. Parfait appartement pour qui souhaite être au coeur du centre historique avec tout ce qui va avec, des joies et facilités (proximité de tous les commerces et monuments) aux petits désagréments (immense foule, activité urbaine). Romeloft were excellent. They accommodated us at every turn. Lift from the airport was perfect. The heating was broken when we arrived and they fixed it straight away. Staff were lovely and easy to deal with. Great price at a great location. Would recommend. Will use Romeloft in future. Great location. Perfect welcome. Full expectation. thank you. This apartment has a superb location. Very nice apartment. Would definitely stay here again even if we had to carry our luggages 4 floors up the stairs. Located on the 3rd floor, you may not mind the absence of a lift as the climb is a short one. The entrance area is very distinctive and charming. You pass through a bright corridor with large windows, modern paintings, and an oriental carpet. The living room is welcoming with a comfortable double sofa bed, two velvet armchairs, and a low coffee table. There is also a colorful carpet, a flat 32″ TV, and a library full of books. 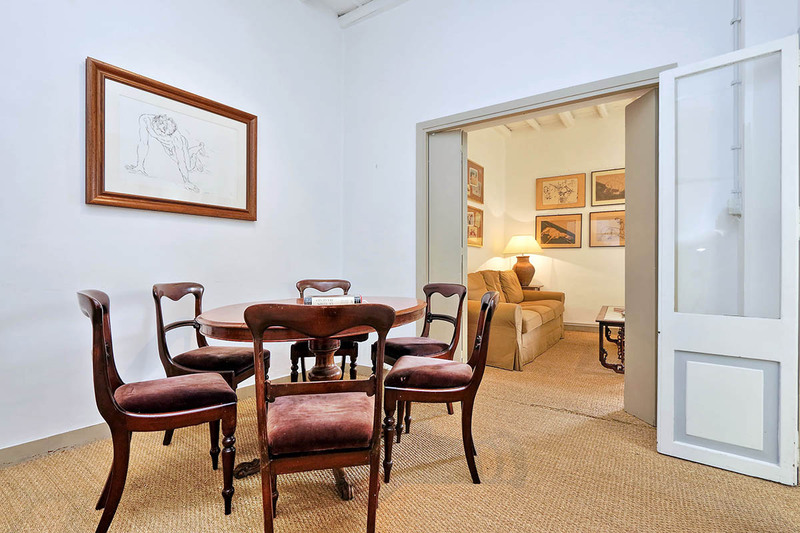 Next to the living room, there is a dining room with an inviting antique round wooden table with chairs, where you can have a great dinner, and interesting drawings on the wall. The kitchen is extremely well equipped with all the necessary kitchenware and tableware. It features a gas stove, an oven, a microwave, a fridge, a freezer, and a washing machine. 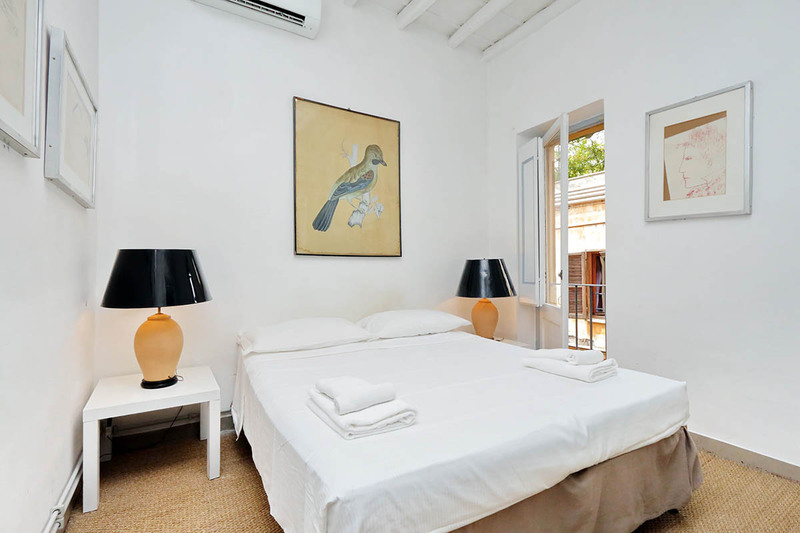 The master bedroom has a king size bed, night tables with lamps, closets, and delightful paintings. 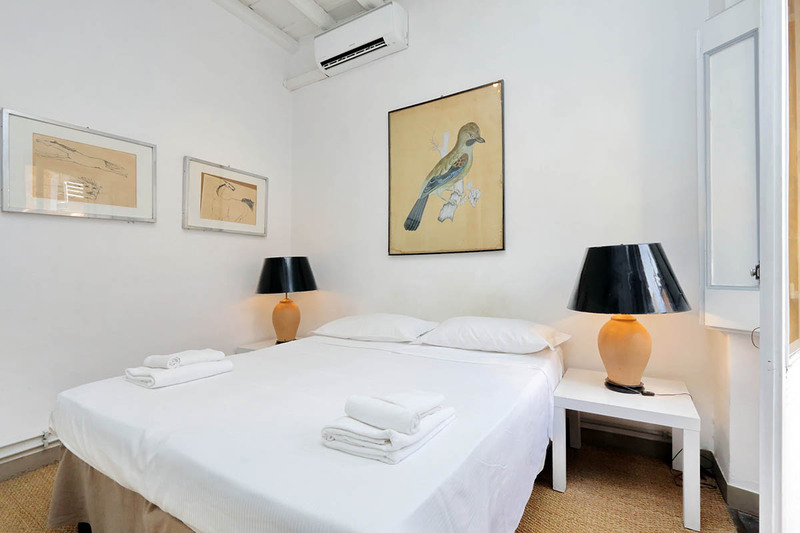 No need to worry about warm summer days as there is an air conditioning unit in the room. There is also a central heating system. The bathroom has a bathtub, together with a shower-head. 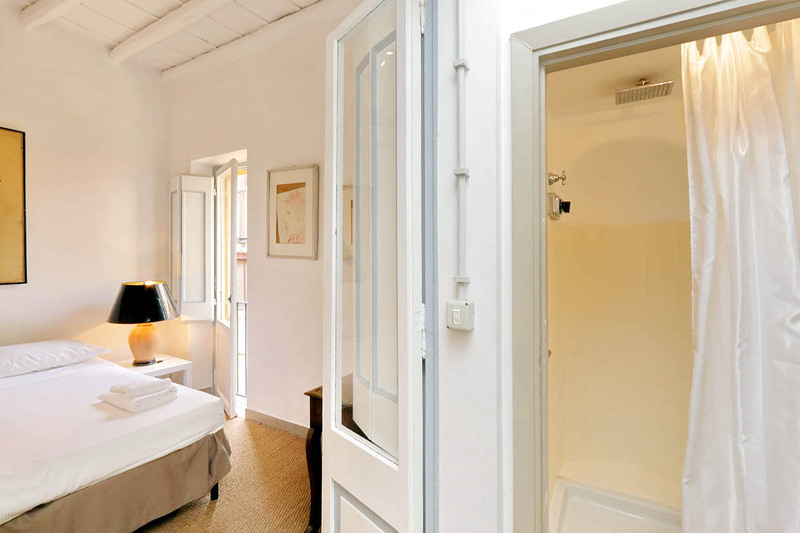 There is also a small separate room with just a shower, in case you would prefer to use this. 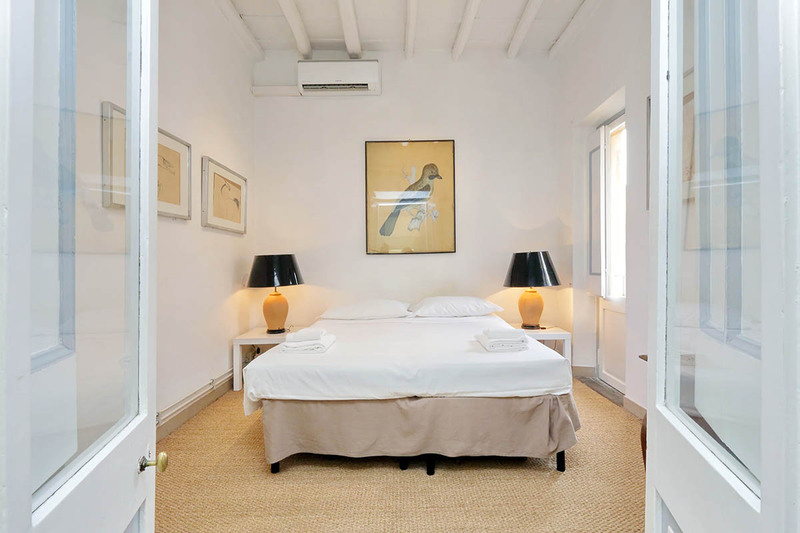 This Spanish Steps lovely apartment will certainly make you feel right at home with its cozy furniture, its white wooden ceilings and its beautiful oriental carpet. In the Spagna area you’ll find the best fashion designer stores (Gucci, Prada, and Salvatore Ferragamo, to name a few). In addition to this, the most important touristic attractions the city has to offer are within walking distance from your front door. These include Piazza di Spagna, Trevi Fountain, Piazza del Popolo, Villa Borghese, and Piazza Venezia. The best time to visit some of these is at night, when the crowds have disappeared. This is especially worthwhile when visiting the Trevi Fountain. Not only will there be much fewer people, but you can also wonder at the enchanting nighttime illuminations, which create an ethereal glow. Moreover, this area is famous for its elegant restaurants and bars. Here you can enjoy an exquisite meal in chic surroundings after a satisfying day of sight seeing. In addition to this, Spagna is a stop on the Metro A line. 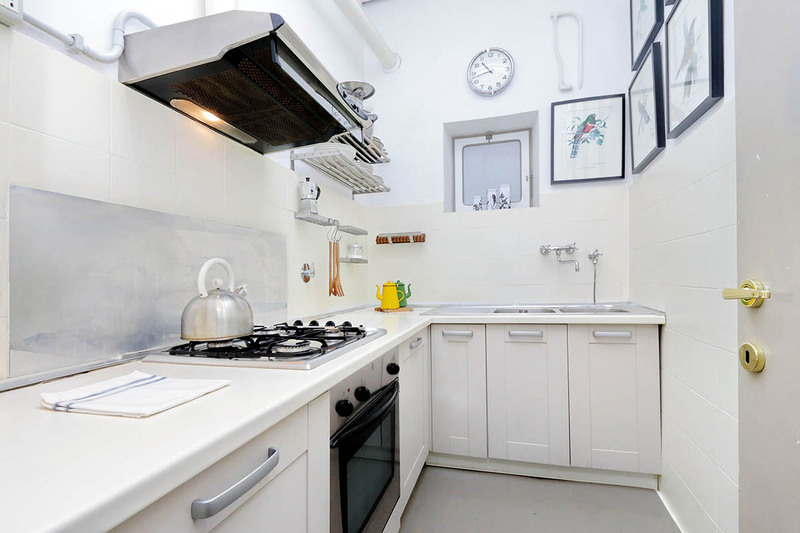 This offers direct access to the central station, termini, as well as connections through to the Colosseum and the Giardino degli Aranci. 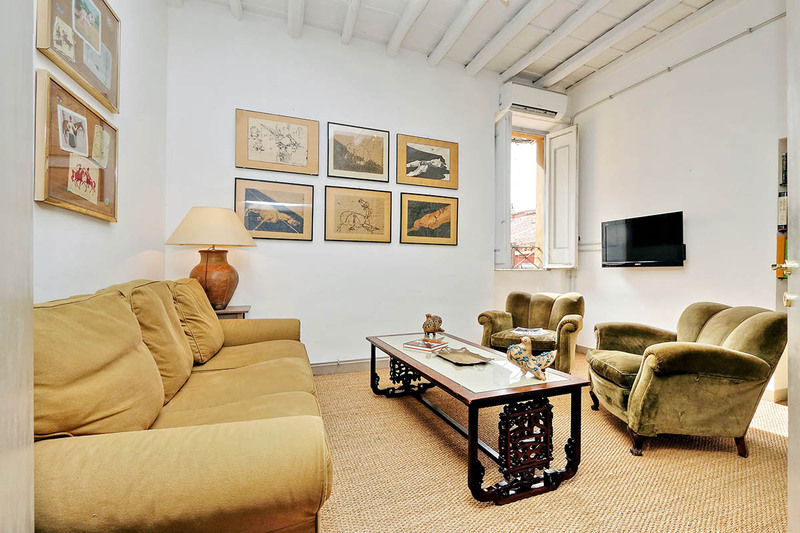 12 people are currently looking for apartments in Piazza del Popolo area. Reserve yours now. The location is very convenient to Spanish Steps and shopping, if that's what you're looking for, extremely crowded if you like more secluded places. The design of the apartment is charming, layout food, and it's light and well air conditioned. The chairs in the living room need some attention as the bottoms are breaking. The bath...Read Moreroom is good; but the light is not great around the mirror, so difficult to shave for a man. The shower stall is good. The beds are good; but the pillows could be better and doubled. We felt right at home in this lovely apartment. 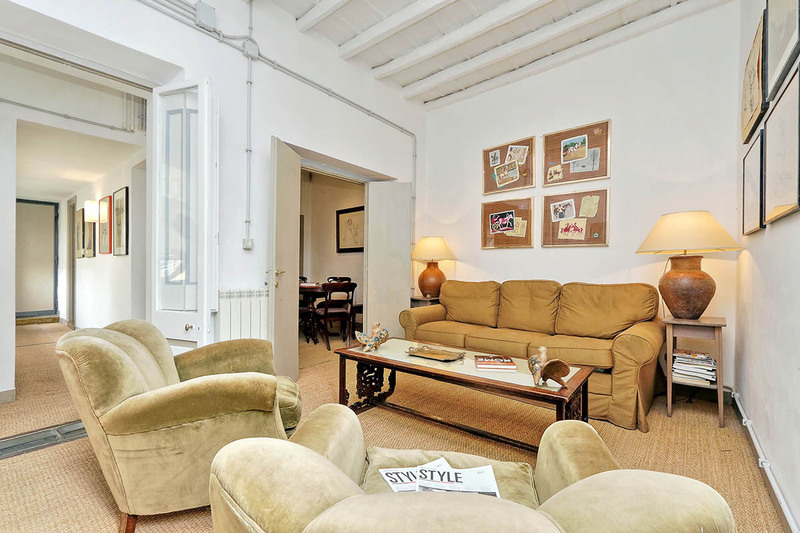 While there was much energy outside on streets around Spanish Steps, the apartment was quiet, cozy and comfortable. A perfect place to relax and unwind after a full day of walking. 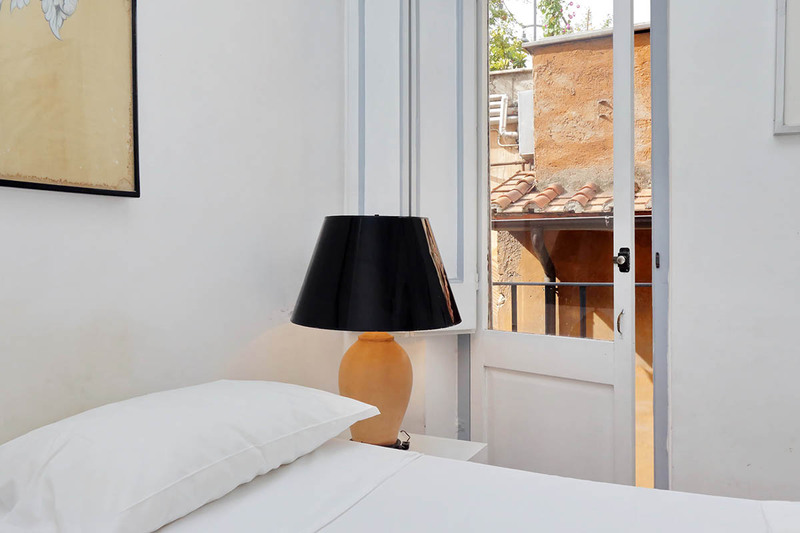 The bed and bedroom are comfortable, the living room is a nice place to relax, the dining room table makes a great pla...Read Morece to eat or work, the kitchen is functional (if small as I imagine most Rome kitchens are), and the bathroom is immaculate. The Metro is very closeby, which we only used once. The taxi stand is also nearby, which we only used once to return to the airport. RomeLoft arranged for pick up at the airport, and our greeter/driver (Honey) was welcoming and informative, as was the representative who initially met us at the apartment. 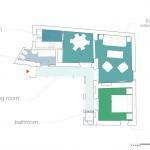 This is a great apartment in a fantastic location. If I were to return to Rome I would have no hesitation about staying in this apartment again, and I'm pleased to recommend it to others. 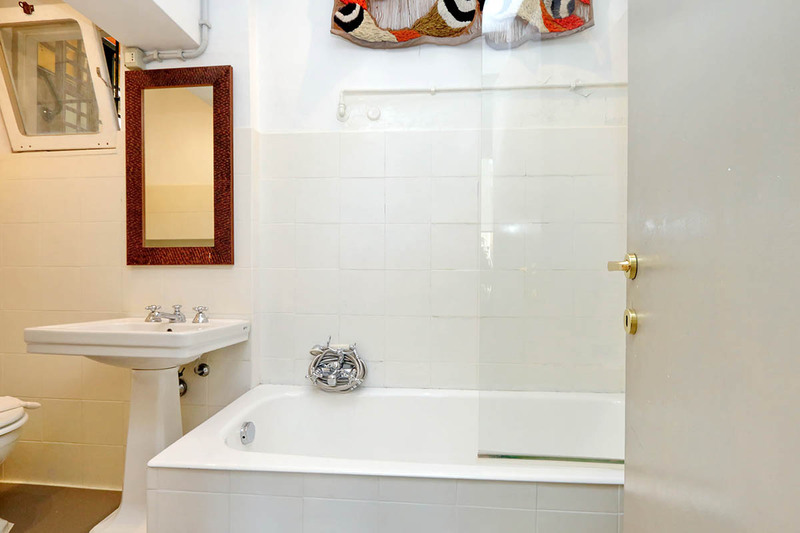 Spanish steps puts you in close proximity to everything . The Spanish steps lovely apartment is literally right next to the Spanish steps . It's large enough for a family of 4 with a clothes washer two showers ,air conditioning and nice dinning room .there is a great 4euro pasta place next door great for a quick snack and a grocery store down ...Read Morethe street the only draw back is there is no elevator and it is a hike up several flights of stairs after a long day of site seeing its a struggle to get up the stairs but once your in the apartments it's easy to relax and did I mention the location. If we’re in Rome, we always like to stay very near the Spanish Steps. 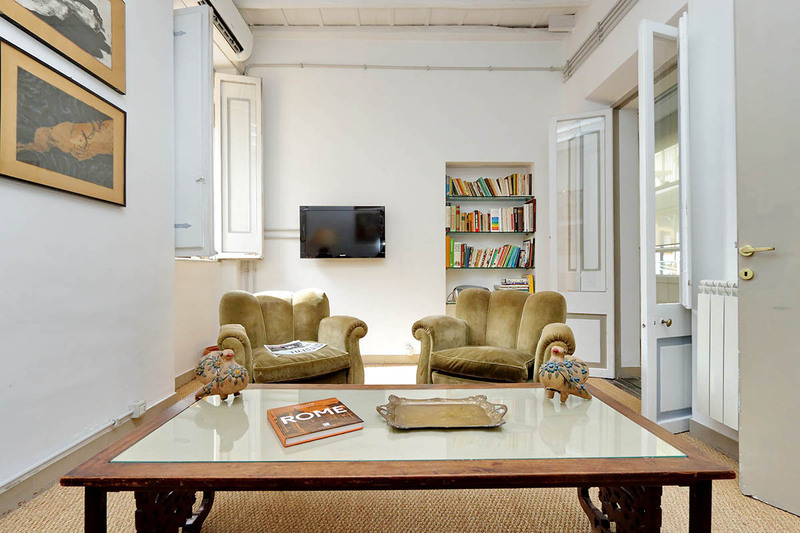 But my favorite place to rent is from Rome Loft, (Via della Croce, 6). It is very conveniently located near the taxi cab corner and the metro is just walking distance. There’s also Carrefour nearby in case you need something quickly and ran out of ingredients while cooking. ...Read More There are lots of airbnbs nowadays and probably cheaper. Maybe. 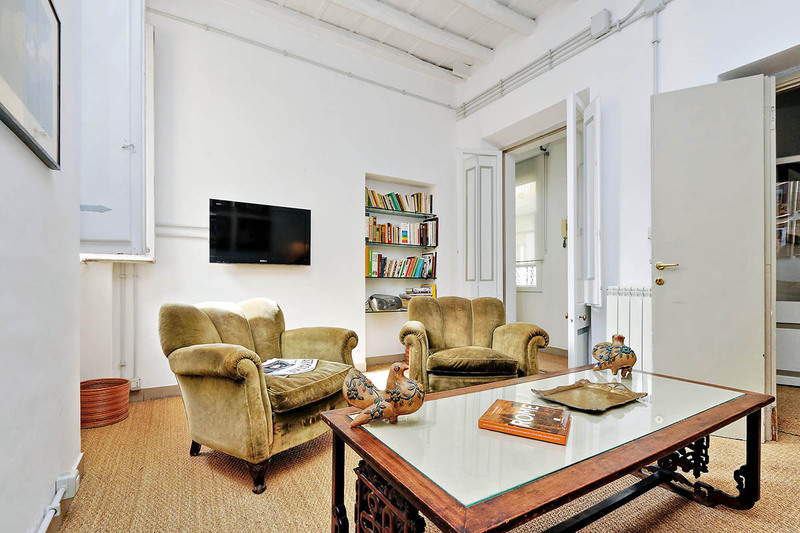 But what I love about Rome Loft is the speed in service in case you encounter a problem. Sibilla and the keyholder is always there for you to solve any problem you encounter quickly. The first time we tested their service is when we got stranded in Rome since there was a landslide in Cinque Terre and they found us a place to stay right at that moment. We stayed in an Airbnb in Siena and the owner was just money conscious not service conscious. Besides the apartment, proven service is very important to me. Never thought it would be this good. The location... Well, couldn't be better. Literally 10 steps and you are in Spanish Square, all the facilities, restaurants, pizzeria, shops and Metro are here. The apartment itself is in an great old building, but with all the comfort you may ask for. In the eight days I was in Rome I never took a public t...Read Moreransport, I walked to all places such as piazza Navona, Pantheon, Trevi etc. it helped to keep the weight down, considering the fantastic food available. The other remarkable fact is that I saw Nissar when he showed me the apartment and left me the keys, and then I never saw him again, the apartment felt like my own, great feeling. I would do it again, and I will. Thank you Nissar, thank you Romeloft. My partner and I stayed here for 4 days. The apartment is located on the third floor (and no lift as far as we could tell), which might get tiring for some travellers (especially if you like to come and go multiple times throughout the day). 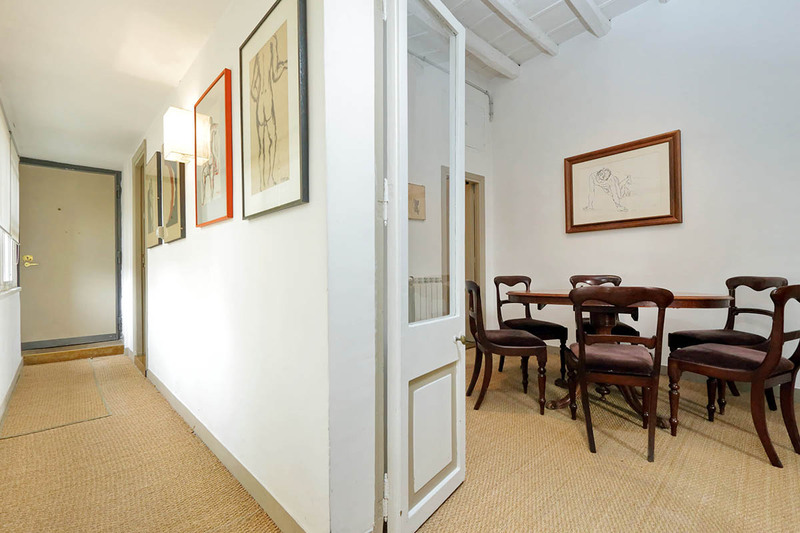 Location wise, it is perfect, close to all the shops and around the corner from the Spanish Steps. It is ...Read Morevery close to the metro station (we used it to get to and from the airport). There are great pizza and pasta options on the same street (which we kept going back to). The apartment is perfect for a couple (I would not recommend more). We cooked only once and the kitchen had all the basics. There is a supermarket nearby. The bathroom is clean and well lit (we never used the second shower). The flooring (apart from kitchen and bathrooms) is an interesting straw-mat style carpet which massaged our feet after a long day's walk! (but we can appreciate it might not be everyone's cup of tea). The wi-fi was good (and accessible through most of the house). We were there in Winter and the column heaters were more than enough. While there is a washing machine, it would have been nice to have a separate stand to dry the clothes (there is a line in the bathroom but it can hold very limited number of things). 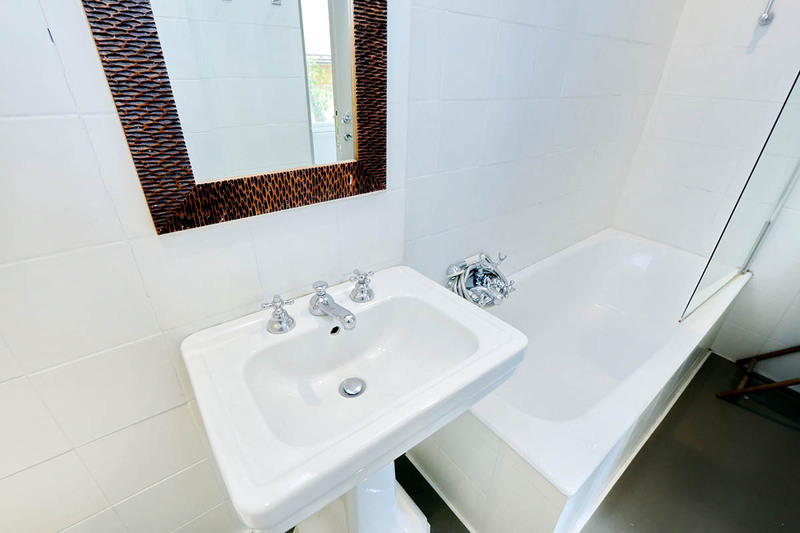 The staff were great, easy to communicate with and on arrival and we always felt safe and secure in the apartment. We are used to booking through airbnb but decided to try RomeLoft on this occasion. If you are after a more 'lived in' feel, airbnb (or even the other RomeLoft apartments) may have better options. If you just need a clean, functional apartment as a base, than this place does that well. We checked into the apartment which was very central in location and our check in process was smooth and we were given advise on places to see and eat, which was appreciated. Mr. Honey and his team looked after us very well and resolved a few small issues (very little toilet paper at point of check in ) very quickly and were very approachable. We l...Read Moreoved Pastifico (the small pasta take away place next to the apartment ! great pasta for 4 Euros!! Also the Indian Restaurant suggested by Honey (SITAR) was excellent food and we ended up going there twice ! When we first arrived here, I think we were expecting more of an 'American style' apartment in terms of size. 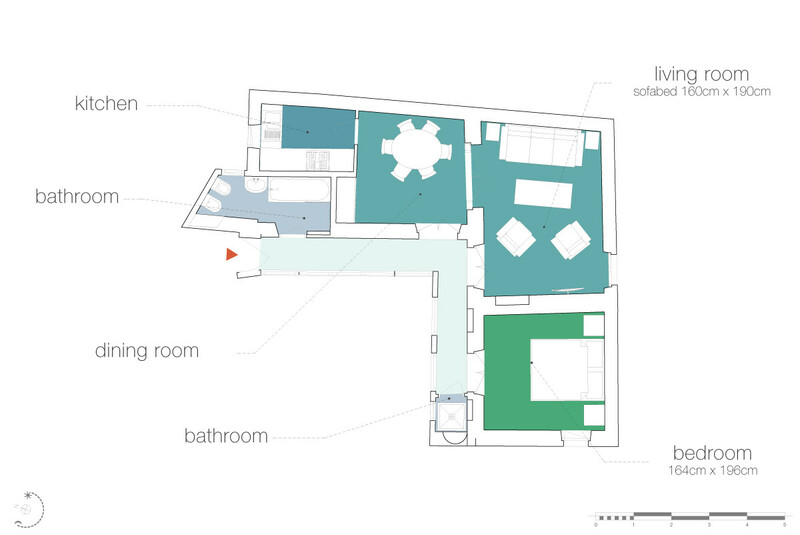 However, with just two people, this apartment was the perfect size! It was very cute and had a certain charm to it that can't be beat. The location absolutely PERFECT! We were within walking distance of many things (which is ...Read Moregood because you will walk A LOT in Italy) and were very, very close to the metro (not even five minutes). The surrounding area is all very nice, and very cute! Lots of great shopping and beautiful photo opportunities. On the street this apartment is on, Venchi gelato is something you can't miss, and the Bar D'Angelo a little further down was where we spent every breakfast when not in another city. The apartment itself was, again, very nice. My only complaint was the carpet/floor. OUCH! After walking around on cobblestone all day, the strange carpet texture was very rough on our feet. We had to wear shoes in the apartment so our feet weren't sore. Other than that, it was honestly a perfect place to spend a fun and exciting two weeks. I would definitely recommend! When I first decided to go to Rome to celebrate my 30th birthday, I couldn't decide between a hotel and an apartment. My friend had recommended RomeLoft so in the end, I went with the apartment idea. I am pleased to say that from the moment I booked with RomeLoft, I was greeted with regular correspondence, swift replies to questions and pro...Read Morefessional service. When we arrived in beautiful Rome, our driver was early so we didn't har to wait. He dropped us off near the apartment as we were far too early for check in but in the end, they checked us in early anyway, which was really kind. We were charged 55 euros as opposed to the 48 euros for the cab which I'm not sure why. The apartment itself was very rustic and traditional. I loved the books in the shelves and the authentic art work; it made me feel as if I were in Italy. The location was absolutely PERFECT! We were 30 seconds from the Soanish Steps and right near the John Keats museum! The room itself had a booklet to help us which was also very kind. My only gripe is that the air conditioning in one of the rooms didn't work well and we were very hot at night but the man who checked us in did immediately come but he couldn't fix it. Other than that, I had an amazing time in Rome...the city is like a beautiful sonnet with beauty on every corner. I am so pleased I saw the city with RomeLoft and I would definitely stay with them again. Thankyou!!! Mi familia y yo disfrutamos de una semana maravillosa en Roma. Descansar en este pequeño pero confortable apartamento hizo que nuestra estancia fuese mucho mejor. Excepto el aire acondicionado del dormitorio, que no enfriaba lo suficiente, todo funcionó correctamente. Era un lujo estar al lado de la Plaza de España y poder ir a pie a todos parte...Read Mores o coger el metro en la parada que estaba a 30m. Todo correcto con Romelot. Seguro que repetiremos y lo recomendaremos a los amigos. Un cordial saludo y hasta siempre. Thank you for the lovely apartment. It was clean comfortable and was in a great location. Everything went well and the airport pick up went smoothly too. Would recommend.